"Al is down on his luck, scraping together a living busking on the streets. When rumour of a competition in a local diner to win a recording contract reaches him, Al has to think fast if he wants to be in with a chance of winning both the competition and the heart of Laura. Late one night he unintentionally releases a 5,000 year old genie who, through evolution, has become enslaved in a Jukebox - the excitement starts here as rock 'n' roll fame beckons. But what'll happen when Laura finds out that Al really is The Great Pretender? An uproariously funny, high-energy musical packed full of hits from a golden era, including Great Balls of Fire, Do You Love Me, All Shook Up, Oh Boy, Let's Dance, Shakin' All Over, Three Steps To Heaven, Runaround Sue, Let's Twist Again and many more. This brilliant and hilarious tale of rock 'n' roll, romance and destiny is guaranteed to warm hearts, get those feet tapping and audiences dancing in the aisles. 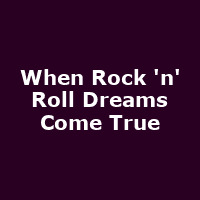 So put on your dancing shoes and get ready to find out what happens When Rock 'n' Roll Dreams Come True!"